Q. Is it really possible for anyone to live happily to 100? A. Your Body Wants To Be 100! The human body has a beautiful design, a design that can carry it one hundred years or even more. But YOU need to learn how to get out of the way. YOU need to learn how to help the body do what it does best: LIVE! I can talk about the many challenges to longevity, but my experience tells me that human behavior is the greatest obstacle to longevity. Q. If our bodies naturally can live to 100, why are there so many people over age 80 who live with pain, ill health and limited mobility? Everyone would love to live to a �ripe old age� but none of us want to live that long if it means looking and feeling like a �ripe old vegetable.� We are surrounded by so many elderly men and women who are wildly unhealthy. We look at them and think: �Being bent in half and wheeling around my oxygen tank is not my idea of �golden years�.� We all need to understand that getting old does not mean getting decrepit. If we live well, and embrace the Secrets of Longevity, we can be vibrant and active and look forward to our 100th Birthday! Q. What about genes, disease and natural disasters? Aren�t these all primary predictors of longevity? A. Of course they are. But the one thing we can control is probably the single greatest determinant of how long we will live and how well we will live, and that is our own behavior. What we eat. When we eat it. How much we eat. Where we eat it. How we work. How we rest. How we play. How much we laugh. How we start our day. How we end our day. How we give and receive love. These are the things that will help us live to be 100. Q. What is so unique about the �longevity secrets� that you write in your book? A. These secrets come from a 5,000 year-old tradition of Chinese medicine. Having come from a medical family and having practiced acupuncture and Chinese medicine for over 20 years, I can tell you that people everywhere desperately need this information. The genesis of this book really started after I nearly lost my life when I fell from 3 stories and was in and out of a coma for a month. I have my life and my health today because of the regenerative powers of Chinese medicine and I feel strongly compelled to share what I know with the world. Q. Is everything downhill after age 50? Is it too late for me now that I am older and not so healthy? A. Mid-Life Should Be A Celebration (Not A Crisis) and also the good news is, no matter who you are, how old you are and where you are, it is not too late if you start implementing the tips from �Secrets of Longevity�. If you�re going to live to be 100, fifty is definitely the mid-point of your life. People who follow the many secrets I have shared in this book think of fifty as �the best is yet to come.� Those who are reckless with their bodies, fighting its design and fighting against the rhythms of the planet think of fifty as �the day to get my papers in order.� Start making changes today and experience more energy, better memory and more enjoyment of your life. Q. 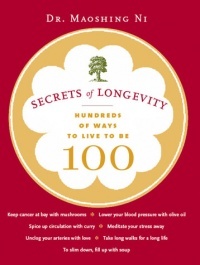 What are the secrets to eating for longevity? Did you know rats that eat blueberries don�t get Alzheimer? Research shows rats bred to develop Alzheimer do not get the disease if they incorporate blueberry into their diet. And other berries are good for you due to their high antioxidant content including strawberry, black berry, raspberry, mulberry and cranberry. Q. What are other things we should do? With about a quarter of a million people dying in America every year from drug-related complications and medical errors, it is imperative to get a handle on your health as naturally as possible. One of the best self-healing technique is meditation. Meditation teaches you to breath properly which is critical for eliminating up to 70% of your body�s toxins and wastes. It also quiets your mind and lowers your stress hormones. It teaches self control and self discipline which are necessary attributes to achieving your health and longevity goals. Q. What are daily routines that can impact health and longevity? Q. What is a simple thing we can do every day to affect our longevity? A. Sleep Your Way to a Hundred! I need to talk about a very unpopular topic: rest. You know the popular saying �You can rest when you�re dead�? Well, it�s certainly catchy but it should probably say: �If you don�t rest regularly, you�ll be dead a lot sooner.� Modern countries don�t value rest and this is criminal. It is also dangerous. The body is an instrument with live rhythms you MUST respect. If you feel tiredness, a fifteen minute �power nap� can jump-start the second half of your day. And you will be more fully alive to enjoy it! If you want to live to be 100, you need to take a few naps along the way!